This project proposes the development of a linear orchard consisting of Community Heritage Orchard, Soft Fruit Garden and Nuttery along the urban section of the Tralee to Fenit Greenway. The proposed site is a strip of scrub land which runs along the east side of the route between the Rock Street entrance and the access point to St. Brendans Park and Connolly Park. The project aims reconnect with nature through food, landscape and community, to provide an example of how we can introduce food back into the urban landscape and increase local food security, through relearning the art of growing our own food. Orchards have played an important role in communities for many centuries, providing a focal point, a gathering space, and a place where people and the rest of nature successfully work together to create abundant harvests, providing fresh fruit long before the time of global freight. Once a tree is established, it can provide a large yield of fruit and nuts year after year for decades, requiring little human input when compared to the growing vegetables. As a deep-rooted, long-lived perennial, the tree has time to adapt to local conditions and be more resilient. Orchards and Nutteries provide vital green spaces in our towns, where people are encouraged to interact with nature either through becoming custodians of the trees or by simply being around them and enjoying their shade, beauty and fruit. Initiatives like this can helping to create healthy, diverse and resilient networks and systems, while reducing our impact on climate change and environmental degradation. In the past this railway formed a barrier between communities, now development as a public amenity it has the potential to bring once divided communities together, the aim of this project is not only to create an orchard but to bring together the communities which adjoin the greenway for a common project and to imbue a sense of shared ownership which is seen as critical to the success of the greenway. This project will also fulfil the work of the All-Ireland Polinator Plan, produced by the National Biodiveristy Data Centre. A group of cyclists preparing to depart for a picnic and swim in Fenit during the Kerry Bicycle Festival September 2013 with the proposed site to the right. 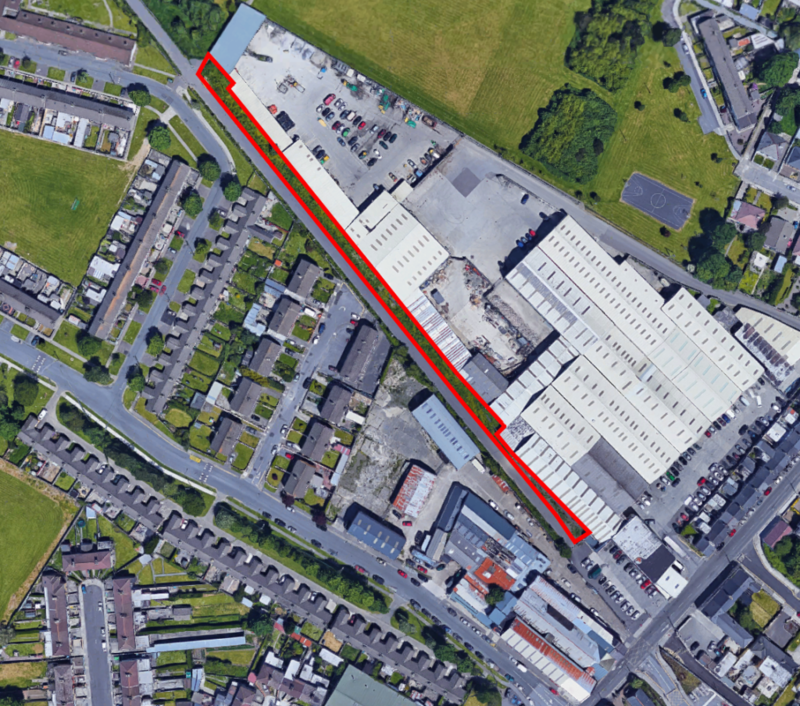 The proposed site is a strip of scrub land which runs along the east side of the route between the Rock Street entrance and the access point to St. Brendans Park and Connolly Park. The site is owned by Kerry County Council and is bounded by a council maintenance yard. The site is approximately 200 meters long and approximately 4 to 8 meters wide it is hoped to plant approximately 30 trees initially. While the rural part of the greenway route is bound by existing native hedgerows, rich in biodiversity, the section in question currently hosts little in the way of biodiversity and the walls of the existing former industrial walls are raw and unsightly, this has been noted to give a negative impression of the greenway especially at its location at the start of the route. The proposed project has the opportunity to transform this area providing a green spine directly into the heart of Tralee town. At a later stage it is hoped to develop the area further by installing seating in addition to the restoration of a former semaphore railway signal located on the site. The site forms part of the Tralee to Fenit and Tralee to Limerick Greenways, a 3km section of the overall route has already been developed within the Tralee urban area from Mounthawk to Rock Street and has proven to be hugely popular with hundreds of daily users. The remaining section of the route to Fenit is currently at planning stage with the hope to apply for funding in Q3 2018. The advice of Kerry County Council’s biodiversity officer has been sought and the local authority will be fully engaged with during this process. Community Participation – all ages can take part in this project. The community has people with local skills and this project will tap into this local skills and knowledge, which they can share with each other. This creates more resilience within communities for future sustainability. This project encourages volunteering and local action. The community will learn how to plant and care for the trees and planted areas. They can then apply this knowledge to their own homes and gardens. This project will complement any community garden or allotments projects in the area. It improves the quality of life and environment for the local people, by the local people. Local Food Source – planting fruit and nut trees in communities means that the community is planning and planting for the future, when food will become even more expensive to ship around the world. By planting the food trees in their own communities they will be able to harvest and process food for themselves. This can be part of a bigger scheme – where the local community identifies old fruit trees in the community that they also may be able to ‘adopt’ and harvest and care for. Enhancing Local Landscape – The concept of edible landscapes is based on using spaces in the community to become productive in food terms and more biologically diverse, supporting many ecosystems and habitats. This project brings this concept into action on a local level.